It's March 24 1993, and the team that coincidentally shares its name with that calendar month finally withdraws from the Formula One World Championship, unable to pay for the Ilmor V10 engines with which it intends to plug on for another season. It's the classic case of an F1 squad hobbling to its grave after spending months on the life-support machine. Just another statistic. Five years earlier March was the most exciting team in the business. McLaren dominated in 1988, only Ferrari able to offer a token challenge. But in only the second year of its F1 reincarnation, March and lead driver Ivan Capelli had looked capable of shaking up the old order. Better still, the team was colourful, young and oozing spirit. Everyone was rooting for the little Italian guy who looked like Dustin Hoffman and his tiny turquoise machine. The story began in 1986 when Akira Akagi, chairman of a large Japanese property company and attempting to promote his new Leyton House lifestyle brand, formed Leyton House Racing. The team was to run the promising Akira Hagiwara in the major Japanese championships, but Hagiwara was killed in a springtime testing accident at Sugo in a Mercedes 190 touring car. Akagi transferred his colours onto a TOM'S-run Dome-Toyota for the Le Mans 24 Hours. The following weekend, still seeking a replacement driver for his Formula Two March-Yamaha, he attended the Formula 3000 race at Imola. "The man who physically introduced me to Mr Akagi is now the big boss of Bridgestone, Mr (Hiroshi) Yasukawa, who was following F3000 in Europe at the time," remembers Capelli. Struggling for funds to complete the season in his Genoa Racing March, Capelli was keen to race for Leyton House in Japan and earn some much-needed prize money: "I said to Mr Akagi, 'OK, you will give me 30 per cent of the prize money.' After I finished second for him at Fuji I was in his office and asked to check the money, and when I did I realised it was 50 per cent. So I was giving back the money to him and he said, 'No, no, you can keep it.' From that good feeling between us we started to talk about sponsorship of my F3000, and then he gave me more money to continue in Europe." With his F3000 car now bearing Leyton House colours, Capelli won the Austrian GP support race on his way to the title. And his luck still hadn't run out... After the last of his three races in Japan, Ivan and his big pal Cesare Gariboldi (the boss of Genoa Racing) were in more discussions with Akagi. "We were still talking as we went to the airport," says Capelli, "and finally at the airport we shook hands and Mr Akagi said to me, 'You are in F1 and I will give you four million dollars!" Ian Phillips was a party to this. 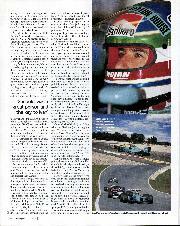 An Autosport journalist, Phillips was a friend of Capelli's and Gariboldi's from covering F3000. He was also working in Japan in '86, looking after Marlboro's sponsorship of Mike Thackwell with the Nova F2 team. Capelli had some Marlboro backing, so he also became Phillips's responsibility in Japan. The FIA had announced that turbos were to be banned from F1 for 1989, with naturally-aspirated engines being phased in through '87 and '88. The time was ripe for March to make a low-key return to the sport's pinnacle. For Capelli and Gariboldi, the Italian importer for March, this was an obvious liaison. Another figure close to Phillips was March boss Robin Herd. Phillips recalls: "About six weeks later Robin phoned me and said, 'How would you like to run an F1 team? There's a factory ready to go. You've got 24 hours to make up your mind.' I agreed, but when I got there the factory was empty, the phone lines and gas were cut off... I didn't know a mill from a lathe!" March modified its F3000 car to accept a Mader-prepared Cosworth DFZ engine and went F1 racing, but although Capelli showed flair he was hindered by reliability. "Eventually Brian Hart, who was looking after the same engines for Tyrrell, tipped me the wink that there were some dodgy piston rings in circulation," says Phillips. "We bought another engine from Frank Williams, who'd got a Cosworth just in case, and we had that one looked after by Brian, who set a new standard." In the meantime, the team had managed to procure the supply of a new engine for '88. John Judd was working on an F1 adaptation of a powerplant that was derived from a Honda design. 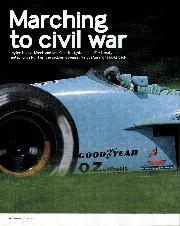 He needed permission from Honda to go ahead, and Leyton House/March got it. Significantly, in August 1987 Adrian Newey, who was race engineering Mario Andretti's Indycar, agreed to return to March to design the following year's 881. "Robin Herd had very much been a mentor through my early career," says Newey. "I had a flexible contract on the Indycar side, so come midseason '87 I started backing off on the Indycars and picking up on F1." A gifted aerodynamicist, Newey started designing the car around the dimensions of the small Capelli. 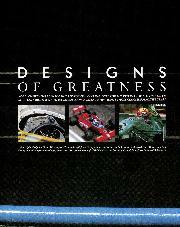 "The cars at the time had become very uncreative animals," continues Newey. "In the turbo era the main way to make your car go quick was give it more boost and put bigger and bigger rear wings on — they'd pretty much ignored aero efficiency. In many ways it's one of the cars I'm still proudest of, because it completely changed the design direction of F1. Although the Tyrrell of a few years later (1990) was credited with being the first raised-nose car it was actually the March — we raised the nose underneath and tried to make it an extension of the front wing. "We sat Ivan in the mock-up and kept moving the pedals towards him and said, 'How far can we go for you still to be comfortable and drive the car?' He came up with a number and we built it to that number, but when he came to drive it he was a bit squashed. It was due to our inexperience and his that it was too small." It was even worse for Mauricio Gugelmin, signed to drive the second March. The Brazilian, while quite a small chap himself, was taller and stockier than Capelli. Mid-season changes were made to the 881, which initially suffered from low-speed mid-corner understeer. Then came that end-of-year burst. 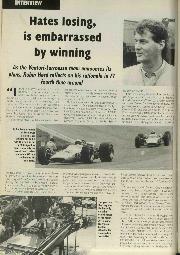 Suddenly Capelli was F1 's New Star. On successive weekends in Portugal and Spain, the Italian had the affront to overtake Ayrton Senna's McLaren. In Japan he was battling the other McLaren of Alain Prost and, briefly (lap 16, fact fans), actually led across Suzuka's start-finish line. Prost then repassed before the March retired with 'electrical' problems ("Ivan switched the engine off by mistake!" grimaces Phillips). Even so, to Phillips's glee, March outscored the other Judd engine user, the mighty Williams, by 22 points to 20 in the constructors' championship. "We were looking forward to 1989 with a lot of optimism," says Capelli. The first blow came in early '89, when Gariboldi was killed in a car crash. 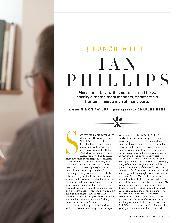 "The spark went out of Ivan at that time," recalls Phillips. "Cesare was a great person to have around and he was the key to Ivan. He could translate what he wanted to the engineers." Capelli adds: "Cesare was like a second father. He was my eyes and my brain outside the cockpit. It's true that I tried to replace him, but I couldn't manage to build up the same kind of relationship." On track the CG891 (the 'CG' a tribute to Gariboldi) was struggling too. 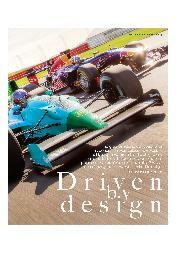 "We were overambitious in the design," says Newey, "plus the new Judd engine was a step backwards. When you look through the history books a new team that does well often flounders the next year — in our case in '88 we were trying to develop the current car at the same time as designing the '89 car. We didn't have the infrastructure." Capelli failed to score a single point, the season only lightened by Gugelmin's third place in Brazil (in the old 881), and things were similarly bleak in 1990. At Mexico in June, both cars failed to qualify. Newey takes up the story: "We used the Southampton wind-tunnel on which — amazingly we hadn't realised — the rolling road was aluminium sheets with a wooden centre core. That had started distorting with heat, so it was getting more and more bowed. So we were developing cars that had we been racing on bowed tracks would have been fantastic! We finally realised it in the spring of 1990, put it right and redeveloped the aerodynamics (through underbody modifications)." At the Brazilian GP Phillips had been taken ill with meningitis. 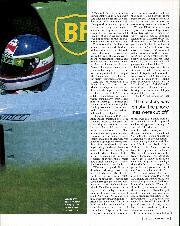 Leyton House was also running into financial problems. "Akagi was starting to struggle," says Newey. "He borrowed heavily against the banks but had to be seen to be still in F1, because if he pulled out the banks would have wondered why. He was playing a poker game on the minimum cost possible, so he was reducing the budget constantly and brought in an accountant (Simon Keeble). When Ian had his meningitis Keeble suddenly assumed power and that really was the beginning of the end — having an accountant running an F1 team was a disaster. He and I fell out in a big way." Newey already had an offer from Williams and, encouraged by Ian Phillips, ("It was the right thing for the good of his career"), accepted it. As well as fighting his illness, Phillips was also the intended victim of an intra-team coup, his position rescued by Capelli. "Ivan was the prime mover to save my job," he says. "The entire race team supported him. There were these complete clowns who had seen the opportunity to get in." Including Keeble? "I won't comment." Phillips made his return at the Hungarian GP, but at the end of the year accepted an offer to join the new Jordan F1 team for 1991. 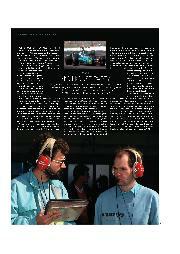 Before his departure to Williams in mid-1990, Newey had already started work on what would have been the Leyton House CG911. "Adrian left it all on the drawing board, but the person who took over probably didn't realise that the car he'd left there turned out to be the '91 Williams!" chuckles Phillips. "Everything looked like it. We were quite well ahead with active suspension and things like that." Powered by the new Ilmor V10, Capelli and Gugelmin struggled with the Chris Murphy-designed CG911 in 1991, Ivan scoring the team's only point in Hungary. Keeble was ousted and Akagi was arrested for his part in a scandal over illegal loans. With the team now in real trouble, Capelli, who was on his way to Ferrari for '92, stood down for the last two GPs so that the Mercedes-backed Karl Wendlinger could bring a much-needed cash injection. "I was trying to help them," he says. "It was the same one year before. In 1990, when Alessandro Nannini had his helicopter accident, two or three hours later I received a phone call from Flavio Briatore asking me to join Benetton for the next race at Suzuka. Because I had already given my word to Akira Akagi that I would drive for him in '91,1 said I couldn't do it. This was probably the biggest mistake of my career! 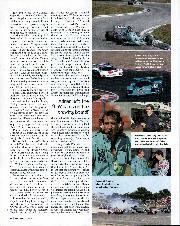 But I was driving a Leyton House car with the name 'CG' — I felt it was the right thing to do." For 1992 the team was bought out by a consortium which included Akagi's British representative Ken Marrable, lawyer John Byfield (the man who would get Jenson Button two F1 contracts for 2005!) and Dutch motorsport businessman Henny Vollenberg. Karl Wendlinger shone in the CG911, now renamed a March, and took fourth in Canada. He was joined by the wealthy Paul Belmondo, although the Frenchman was replaced by Emanuele Naspetti. Wendlinger ran out of money, and for the last two races made way for returning veteran Jan Lammers, a friend of Vollenberg's. Through early 1993 there were attempts to sell the team to a Swiss investment group. Lammers and Jean-Marc Gounon were ready to go as drivers, but the deal stalled. And so, four days before the Brazilian GP, the second race of the season, March was withdrawn from the F1 entry list. A new rule for '93 meant that the slowest two entries in qualifying could not start the race: for the season-opening South African GP these were inevitably the Marches (as their engines hadn't even left the UK!). But with March no longer on the entry list the man who missed the cut in Brazil, in a sad postscript, was Capelli, his career in freefall at Jordan after his disaster at Ferrari. He parted company with the team immediately afterwards and would never drive in F1 again. His name, like that of March, Leyton House and Miami Blue, was now consigned to grand prix history.